About 16 million people suffer from dry eye syndrome in the United States. Health care practitioners are expecting that dry eye syndrome will increase in prevalence because our population is aging. Also, all of us are using the computer more and even more of us seem to be constantly enthralled with smartphones, digital devices, and tablet computers. All of these activities are associated with dry eyes. Dry eye syndrome is a condition in which your eyes don’t produce enough tears to lubricate and nourish the front part of the eye. Tears are composed of hundreds of different types of molecules that include lysozymes (natural antibiotics), vitamins and minerals, as well as mucus, oil, and water. Tear production slowly diminishes as we age. At age 65, we have 65 percent less tear volume than we did at 18. Often, new medical conditions arise as we get older. Many autoimmune conditions have dry eyes as a part of their disorder. Both those medical conditions and medicines taken to treat them can cause dry eye syndrome. Certain environments, such as windy or dry climates, can also decrease the number of tears or make the tears evaporate at a faster rate. Although the quantity of tears is important, you can also have dry eyes if the quality of your tears is not good enough. Having a healthy tear film is necessary for maintaining clear vision. Having tears with too much oil or mucus is just as bad as having a decreased volume of the water component of your tears. Certain components of your tears help to keep your tear film stable. The oil layer of the tears reduces evaporation of the water layer. Some conditions that cause an imbalance in the oil layer of the tears are blepharitis and meibomian gland dysfunction. The mucus layer helps to keep the tears bound to the surface of the eye. This type of dry eye is sometimes referred to as evaporative dry eye. Every time you blink, your eyelid makes a vertical and a slightly horizontal movement in toward your nose. This horizontal movement continuously moves your tears toward the corner of your eye where drainage ducts, called puncta, can drain tears into the nose and into the back of the throat. With every blink, tears are spread across the eye and bathe the surface of the cornea, the clear dome-like structure on the front part of the eye. Symptoms of dry eye syndrome are burning, stinging, sharp pains and tired eyes. Many people who suffer from dry eyes complain of a feeling like they have a piece of sand in their eye. Vision also tends to fluctuate. Treatment for dry eye is multifaceted depending on the severity of the condition. Most treatment begins with over-the-counter artificial tears. Artificial tears are designed to supplement natural tears and to aid in healing the surface of the eye. They are prescribed anywhere from a couple times per day to every hour. Nowadays, artificial tears are available in many different types. Some are preservative free, some aim to increase the water component of the tears, and some aim to stabilize the mucus and oil layers of the tear film. A visit to your doctor will determine which type of artificial tears are best for you. As symptoms increase, gels and ointments are prescribed. Gels and ointments tend to be under-utilized because of their blurring side effects. However, they bring much-needed relief to some dry eye sufferers. Treatment for dry eye syndrome also includes procedures such as punctal occlusion. Punctal occlusion is a procedure in which temporary or permanent implants are inserted into the puncta, the drainage canal for the tears in order to conserve normal tears. 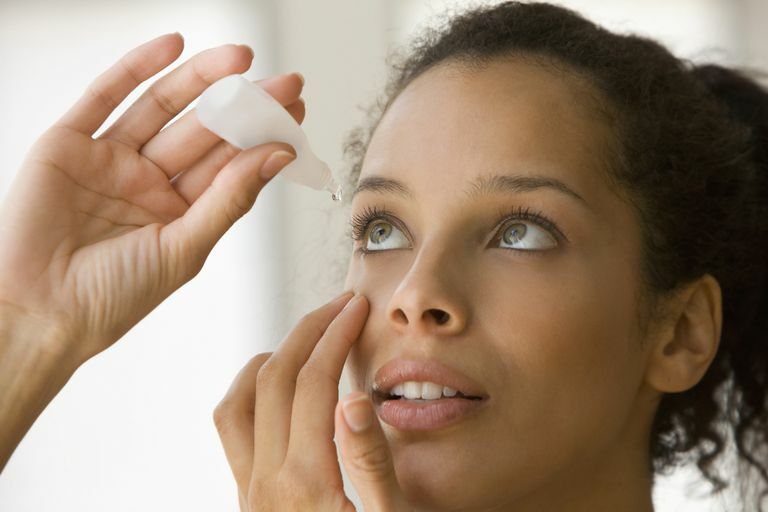 Steroid eye drops are also prescribed in more severe cases of dry eye. In October 2003, Restasis was approved for the treatment of dry eye syndrome. This was an exciting time because it was the first drug specifically approved for treatment of dry eyes. Restasis is not an artificial tear, but rather a drug that actually promotes tear production. Cyclosporin A is the chemical in Restasis and is considered an immunomodulatory drug. Immunomodulatory means that it affects the local immune system around the eye which promotes tear film production. Restasis is an eye drop and it is taken twice per day, every day. Restasis works well, but often the patient does not feel or realize the full benefits of taking Restasis for 3 to 4 months. Because of this, it is sometimes difficult for doctors to cheer on patients to keep taking it. Most of the time, dry eye syndrome is a chronic condition and real physiologic changes occur. It will take time with any type of treatment to show real improvements because those physiologic changes take awhile to reverse. For many years, Restasis was the only dedicated drug solely for the treatment of dry eyes. However, in July 2016 a drug entered the dry eye market: Xiidra. Xiidra is the first of its kind in a new class of medicine called lymphocyte function-associated antigen-1 (LFA-1) antagonist. According to the FDA study, the mechanism of action of Xiidra is the following. Xiidra is an orally active dual leukocyte function-associated antigen-1 (LFA-1)/intracellular adhesion molecule-1(ICAM-1) inhibitor. LFA-1 is a cell surface protein found on leukocytes and blocks the interaction of LFA-1 with its cognate ligand intercellular adhesion molecule-1 (ICAM-1). ICAM-1 may be over-expressed in corneal and conjunctival tissues in dry eye disease. LFA-1/ICAM-1 interaction can contribute to the formation of an immunological synapse resulting in T-cell activation and migration to target tissues. So, what does all that mean? In other words, Xiidra treats dry eye by disrupting and blocking the inflammatory cascade that is responsible for symptoms and eye surface changes associated with dry eye disease. Inflammation is what makes having dry eye so miserable. The burning, stinging, and redness are signs of inflammation and that is what makes us feel bad. In some studies, symptoms and signs improve in as little as two weeks. Xiidra is a preservative-free solution in individual vials, dosed one drop into both eyes twice per day. Xiidra’s mechanism of action is similiar to Restasis in that it affects the immune response. However, Xiidra is a completely different class of drug. Restasis is an immunomodulatory medication that works to reduce inflammation in the tear glands, helping to prevent further damage. It is thought that after taking Restasis for a long period of time, more than six months, it can actually improve tear production and improve the health of goblet cells, which are important in tear film stability. Xiidra and Restasis both target the inflammatory cascade. However, they do not interact with the same molecules so there is no evidence that suggests they could not be used in combination. Xiidra has been thoroughly tested and approved by the FDA and can bring significant improvement in both the symptoms and signs of dry eye syndrome. In some cases of dry eye, superficial punctate keratitis can develop on the corneal surface. Keratitis is an inflammation of the corneal surface that can be seen by doctors by instilling a type of dye into the eye. This procedure is called corneal staining. The staining represents dead or devitalized cells sloughing off of the cornea. Xiidra received the FDA stamp of approval for not only improving symptoms but actually improving the signs of dry eye, such as corneal staining. In fact, in the FDA studies, Xiidra showed significant improvement within just two weeks. Xiidra is not approved for use with contact lenses so you must remove contact lenses before insertion and wait 15 minutes before reinserting them. Side effects of Xiidra include burning, metallic taste and blurry vision—if you experience these, make sure to talk to your doctor. Xiidra costs somewhere between $400 to $450 per 30 day supply, which is approximately what Restasis costs. The cost appears to be similar, but Xiidra has an FDA approval for the treatment of dry eye and Restasis has an approval for an increase in tear production, so competitive factors may come into play. Your doctor will know which is the better option for your particular case, but start the conversation and ask why one is better than the other. Can Punctal Occlusion Be the Right Treatment for Your Dry Eyes? What Does Map-Dot-Fingerprint Dystrophy Mean?